This month's Blaverry sew is the Gracie dress. 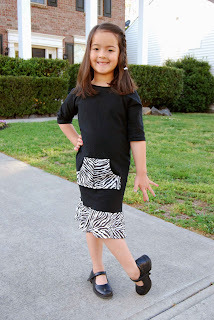 This fun all-knit dress is perfect for my own Katy GRACE! The Gracie by Blaverry features, "...raglan style sleeves, front kangaroo pocket, flounce hem, wrapped neck binding, raglan style sleeves, front kangaroo pocket, flounce hem, wrapped neck binding..."
-Gracie by Blaverry is written for sizes 2-16. 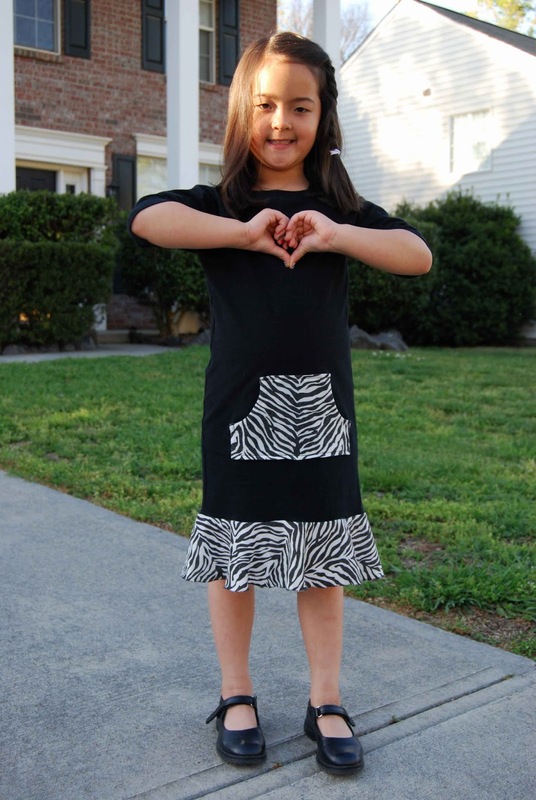 -Gracie by Blaverry PDF sewing pattern includes shaded, step-by-step diagrams and instructions. -Gracie by Blaverry PDF sewing pattern includes a sizing chart and fabric cutting diagram. 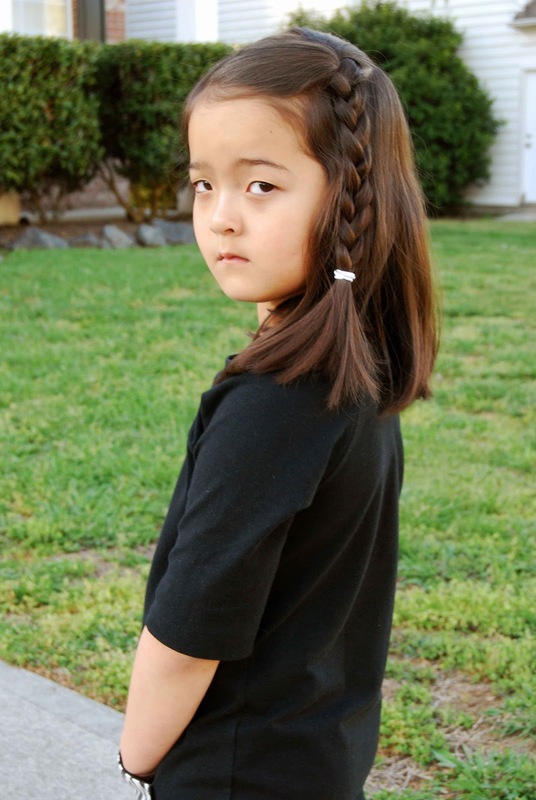 Measurements in the sizing and fabric chart are given in both imperial and metric. 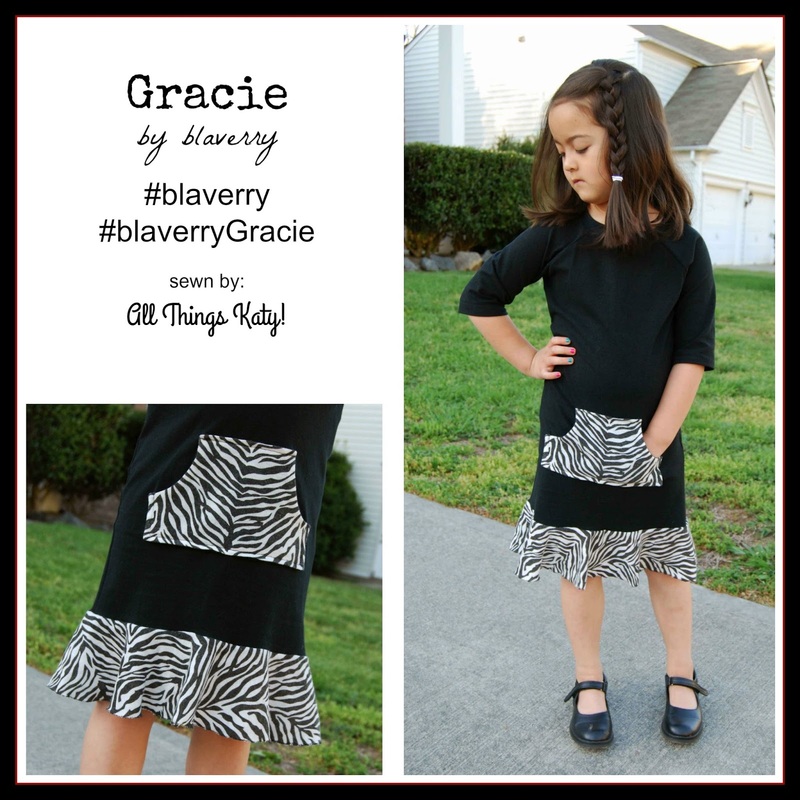 -Gracie by Blaverry PDF sewing pattern includes layered pattern pieces. This means that you only have to print the size that you need/want. Save a tree, less ink, less lines to confuse- Win! I sewed up a straight size six. All fabric was from my personal stash. The black was cotton lycra from Purpleseamstress Fabrics and the zebra print was found on the flat fold table at my local Hancock Fabrics. 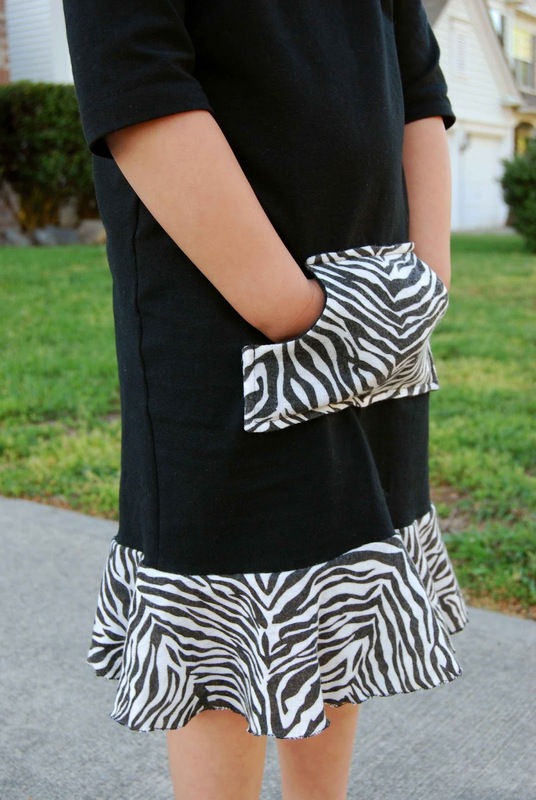 The zebra print is some unknown type of not-so-very stretchy, kind of course knit fabric. The one modification to the dress that I made was the kangaroo pocket. Instead of cutting out one pocket piece, adding interfacing and folding over the seam allowance, I just cut two pocket pieces- one from the zebra print and one from the black cotton lycra. Then, I sewed the pocket pieces RST, flipped and then sewed onto the dress front as instructed. I did this for two reasons 1) The zebra print was kind of see-through and thin. I was afraid it wouldn't hold up to the constant stress of a front pocket. I figured the cotton lycra backing would give the pocket sturdiness and make it less see-through. 2) I know how I sew and I was afraid that by just folding over the edge for the pocket seam allowance that it wouldn't look even and neat. By sewing the two pocket pieces together RST, all the messy, potentially uneven sewing would be on the inside. 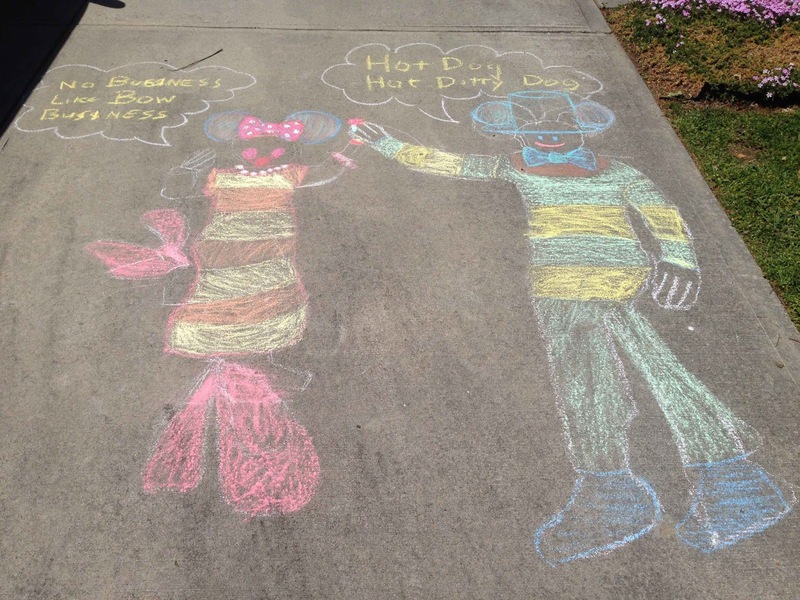 (That little gem is my gift to you- you're welcome;-). Other than the pocket mod, I sewed the dress as instructed and it came together super fast! I was able to cut and finish in under two hours. That's even WITH the rookie mistake of sewing the wrong side of the sleeve to the front piece and having to un-pick serged seams (ugh!). At first, I wasn't sure how flattering this style dress would be on my daughter- the front and back pieces are pretty straight and not so curvy. However, once Lil' Miss put on her Gracie by Blaverry, I really liked it! The all-knit construction of the Gracie by Blaverry make this dress easy to sew and comfy to wear! Simple lines and easy styling make the Gracie by Blaverry another great addition to your PDF sewing library! Also, when you get a chance to sew up the Gracie by Blaverry, be sure to tag it #blaverry and #blaverryGracie on all your social media!